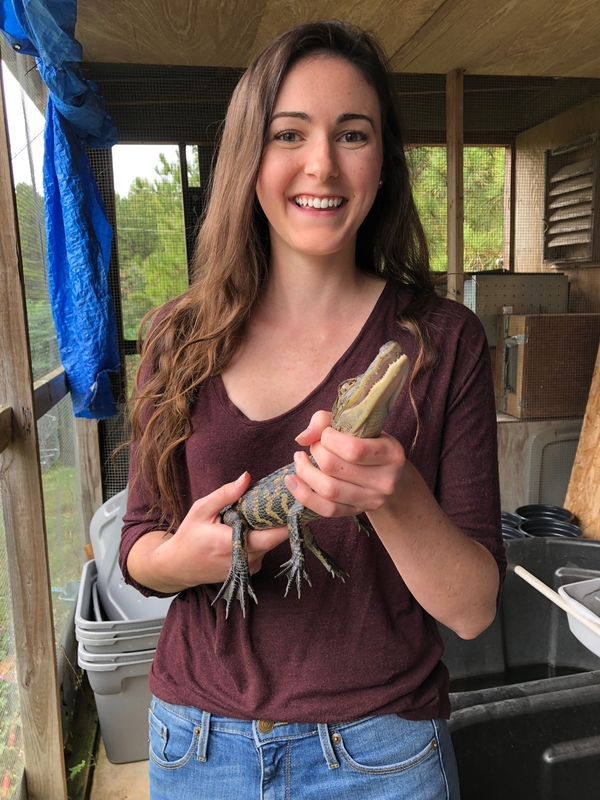 Growing up with a fascination for “The Crocodile Hunter” Steve Irwin, Auburn University student Kaitlyn Murphy has known she wanted to be a biologist since she was five-years old. Originally from Council Bluffs, Iowa, Kaitlyn graduated with a Bachelor of Science in Biology from Iowa State University last year and is currently pursuing her Ph.D. in the Auburn University Department of Biological Sciences. She said she chose to pursue her Ph.D. at Auburn to work with Dr. Daniel Warner and Dr. Mary Mendonca. Kaitlyn is currently working on two different projects, using the American alligator and the brown anole as models. Kaitlyn will continue her study by bringing in 24 newly-hatched alligators from a preserve in Louisiana this week. They will be housed at a thermally-controlled off-campus aviary. Research on the alligators through three treatment groups will be conducted throughout the summer. The study will include collection of internal tissues in the alligators’ gut and digestive tract, brain tissue and other tissues throughout the body. In her free time, Kaitlyn enjoys working as the assistant coach for the Tigers Volleyball Club, coaching kids. She played volleyball in high school and coached as an undergrad. “Getting to teach kids about volleyball is the least stressful thing I do all week,” she said laughing. Kaitlyn said she has enjoyed learning more about Auburn and has been impressed by the working environment in the Department of Biological Sciences. Kaitlyn said she hopes to one day conduct research in her own lab and was excited to get the chance to show her appreciation for Irwin’s influence to lead her to that goal. She recently had the chance to meet Irwin’s daughter, Bindi. Early on in her childhood, Kaitlyn Murphy dreamed of becoming a biologist.